In Memory of Elmore Leonard. Charles J. Rzepka writes, 20th August 2013: A sad day for all who knew the man and his work, but especially for his Detroit fans. Crimeculture is honoured to be able to offer substantial extracts from a series of interviews that Professor Charles Rzepka conducted with Elmore Leonard in 2009-10. There were four separate interviews, arranged here in nine parts. 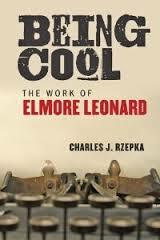 Professor Rzepka’s study of Elmore Leonard, Being Cool, is published this year by Johns Hopkins University Press and is now available on Amazon to pre-order. Elmore Leonard is a crucial figure in any consideration of the development of crime writing in the twentieth century, and he is arguably, as Martin Amis suggests, the closest thing America has to “a national novelist”. In a career that spans sixty years, over forty novels and numerous screenplays and short stories, he has established himself as the best-known crime fiction writer in America and as so vigorous a creative presence that he transcends the categories of popular generic fiction. When he was awarded USA PEN Lifetime Achievement award, PEN praised the “distinct literary style” Leonard has created, suggesting that “books like Swag, LaBrava, Freaky Deaky and Tishomingo Blues are not only classics of the crime genre, but some of the best writing of the last half century.” Photo by Linda Solomon, HarperCollins site. Charles Rzepka, who completed his superb study of Elmore Leonard, Being Cool (Johns Hopkins University Press) in 2013, has had the opportunity to conduct many hours of interviews. Professor Rzepka has established a strong reputation as a critic of crime and detective fiction. His Detective Fiction (Polity, 2005) offered a penetrating analysis of the development of detective fiction in England and America from the eighteenth century on; this was followed by co-editing (with Lee Horsley) the Blackwell Companion to Crime Fiction (Wiley-Blackwell, 2010). In 2009, towards the end of the period in which he was working on the Blackwell Companion, he approached Leonard for an interview and secured not one but a series of meetings, with interviews ranging over the writer’s life and work in extraordinary depth. Several years ago Lee Horsley and I co-edited Blackwell’s Companion to Crime Fiction, to which I contributed a piece on Elmore Leonard. It crystallized for me a recurrent pattern in his work—the apprentice/professional relationship—that became the seed for a book on his fiction. Being Cool: Elmore Leonard and the Work of Writing will be published by The Johns Hopkins University Press later this year. In order to write it, I felt compelled to contact Leonard himself to ask him questions about his early life, his education, and his work habits. The result was several interviews, in person and by phone, comprising some ten hours of recorded conversation. I’ve edited these interivews for Crimeculture because I think they reveal some aspects of Leonard’s fiction, and his attitude toward it, that don’t appear elsewhere. Along with the book, I hope they will encourage other scholars of detective and crime fiction to take up Leonard’s work as an object of serious study. The questions posed in these interviews are astute and probing: after the first of the interviews, Elmore Leonard told him, “It’s a good interview, boy, it’s really — I had to think of, you know . . . things I never thought of before.” Crimeculture is privileged to be able to post extracts from this exceptional series of interviews, and wants to thank Professor Rzepka for giving us the opportunity.